A "Preview result in a helper application" checkbox. When checked, this checkbox allows to start a helper application in order to preview the generated file. 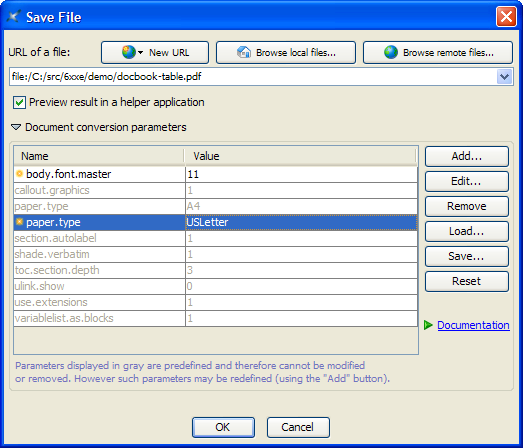 For example, it allows to start Acrobat Reader in order to preview the generated PDF file. How to specify a helper application is explained in Section 7.8.6, “Helper applications options”. A "Document conversion parameters" panel. This panel is initially folded to keep the dialog box as simple as possible. The "Document conversion parameters" panel allows to specify the XSLT style sheet parameters (e.g. paper.type=USLetter) used when converting the document being edited to other formats (e.g. PDF, HTML, etc). Note that the XSLT style sheet parameters specified that way are persistent across editing sessions. Notice the yellow star which precedes newly added and newly modified parameters. The user has redefined parameter paper.type to USLetter. Notice how the user-defined parameter follows the predefined, grayed, parameter. The Documentation link is supposed to open in your favorite Web browser the reference manual of the XSLT style sheet parameters. Therefore, If you select a parameter by clicking on it and then click on the Documentation link, you should be able to read the documentation of this parameter. This generally requires an access to the Internet. This documentation is not always available. Clicking this button displays the following dialog box. 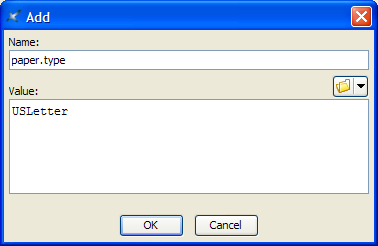 This dialog box allows to the name of the parameter and its value. Note that the value of a parameter may contain whitespace, including newline characters. If, for example, you want to redefine paper.type from A4 to USLetter as shown in the screen shot of the URL chooser dialog box. Select the existing paper.type parameter by clicking on it then click the Add button. This will spare you the effort of retyping paper.type as the name of the parameter you want to add. Allows to modify selected user-defined parameter. Displays the same dialog box as the one displayed after clicking the Add button. Predefined, grayed, parameters cannot be modified. It also possible to change the name of the parameter here. Doing this will simply add a new parameter or replace an existing one. In fact, the Add and Edit buttons may almost be used interchangeably. Predefined, grayed, parameters cannot be removed. Adds parameters loaded from an XML file previously created using the Save button below. Saves all user-defined parameters to an XML file.